Nominations are open for the 2018 Neighborhood Honor Roll and 2018 SAPCC Community Spotlight. 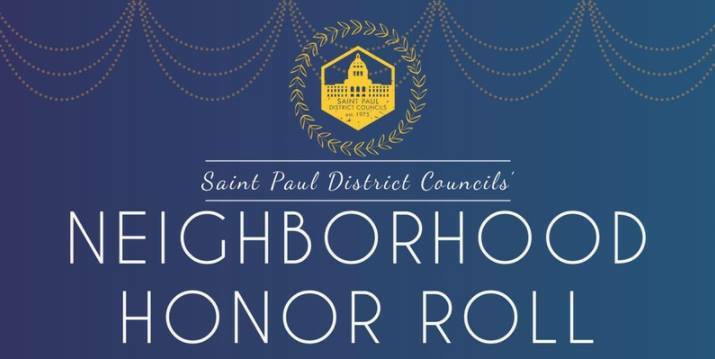 Each year St. Paul’s 17 District Councils recognize outstanding neighbors and partners from across Saint Paul at the annual Neighborhood Honor Roll event. This event allows us to publicly thank the members of our community who give so much time and energy to impact issues that affect us all. This year, SAPCC will also feature community members in our Community Spotlight recognition. Who do you know who has stood out on community initiatives or projects over the last year? Who do you think deserves to be recognized for their efforts? Or email nominations to kathryn@sapcc.org with 75-100 words describing the work of an individual or partnership you would like to recognize. Previous Previous post: Deadline Extended!